Jorge received a Bachelor of Science in Civil Engineering and Architecture and a Master of Architecture from Roger Williams University. During his time in school, he participated in many design competitions, having won the 2017 Tremco Sustainable Practices award and also placing first in the region with his team in the 2014 Design Build Institute of America national student competition. Jorge’s thesis project consisted of an agricultural center in Guatemala, designed to empower the indigenous population through agriculture and architecture. 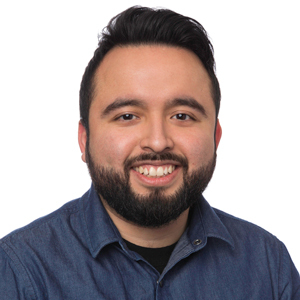 Jorge joined Vision 3 in 2017 as an Architectural Designer working with the Corporate Office Team. He has had the opportunity to work on renovations for Amica and Tech 4, and is part of the team for a Childrens Friend facility. He loves to spend time with friends and family, draw, create digital animations, and play his guitar.